I'm a big fan of Wexler's flintlock fantasy series, The Shadow Campaigns. The first volume, The Thousand Names, was a revelation--marked by great characters, memorable action scenes and incredible attention to detail with regards the tactics and daily lives of modern-era soldiers. The Shadow Throne, which shifted focus from the colony of far-flung colony of Kandahar to the Vordanai metropole, was both highly entertaining and thoughtful. Yet it seemed to lack the tightness and singularity of focus that made The Thousand Names stand out from the glut of new fantasy releases. I am happy to say that The Price of Valor represents not only a return to form, but a leveling up. The Price of Valor is, in essence, a continuation of The Shadow Throne--to a far greater degree than The Shadow Throne is a continuation of The Thousand Names. Winter has been promoted to colonel and is in charge of the Girl's Own, a female brigade serving in the army of military genius Janus bet Vhalnich, which is currently facing the combined armies of Borel, Hamvelt and Mursk--all followers of the Sworn Church and enemies of the revolutionary Vordanai government. Marcus d'Ivoire, meanwhile, has been left in Vordan City to keep track of a deteriorating political situation, in which a cabal of Jacobins has re-formed Orlanko's terror state under new auspices. As in Revolutionary France, this Directorate and its paranoid-obsessive leader Maurisk now seek to "purify" the revolutionary state of its "internal enemies," which seem destined to include Queen Raesinia, Janus and his lieutenants, Winter and Marcus. Making matters worse, the secretive Priests of the Black, who are religiopolitical extremists of the first order, have sent several operatives--each possessing a magic-generating demon--to recover the eponymous Thousand Names, a repository of magic-generating demons itself, including the demon-eating Infernivore that possessed Winter at the end of The Thousand Names. And they have brought Maurisk, who heads the militant Directorate that rules Vordan, into their cabal. If they succeed, there will be no force in the world that can stop them. Here's the thing: while The Price of Valor is not perfect, it belongs to a very small category of books that I just can't put down. While this might not seem like a big deal to some of you, consider that I have trouble doing anything for more than an hour--even the most compulsive of activities, like playing video games. This is why I read fewer books than many of my fellow bloggers. But this one...every chapter urges you forward--"just a few more pages," you say! Then before you know it the clock reads 3am and even if you'd like to keep going, you do have to get up at 6. I also greatly appreciated the political nuance on display as Wexler turns his attention from the injustices that lead to revolution to the question of how revolutions come off the rails. In this case, Wexler lets the reader contemplate whether Vordan would have been better off with Orlanko in power and the Thousand Names safely in Kandahar than with Maurisk and the Thousand Names in play. The gender politics were another high point for me. Vordan (and its neighboring societies) are strongly patriarchal, as one would expect from a world modeled after Europe of the late 18th and early 19th centuries. But even though various characters assume that this is the natural order of things, political events are challenging and even upending deeply-embedded norms--and especially in the military. I look forward to seeing where Wexler takes things from here. Politics aside, the book is also just quality fantasy. There's ample magic and action, strong world building and two memorable, relatable protagonists in Winter and Marcus. And the Penitent Damned are great villains. My only issues relate to two of the secondary characters, namely, Janus (the mercurial genius) and Mad Jane (Winter's fiery, red-haired lover). Janus' ability to think several steps beyond anyone else, to the point where he must be able to predict outcomes of dumb luck, strains the imagination. Meanwhile, Jane is just whiney and annoying--a far cry from her (rather more satisfying) portrayal in The Shadow Throne. She's a drag on the story, frankly, and I hope Wexler finds a new way to utilize her going forward. But these are relatively small quibbles. 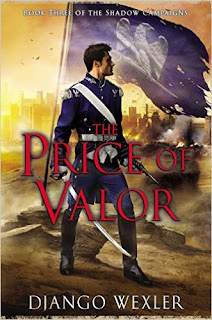 The Price of Valor is a clever, well-written and highly addictive novel, and easily the best in the series so far. Bonuses: +1 for smart, sophisticated politics; +1 for keeping me up at night. Penalties: -1 for Janus and Jane issues. Reference: Wexler, Django. The Price of Valor [Roc, 2015].